COMPASSIONATE CLIMATE ACTION: What Are We Entitled To? 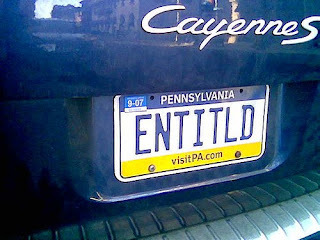 Entitlement. The fact of having a right to something, or the amount to which a person has a right. 1. "You are entitled to your own opinion, but not your own facts." I love that line. I found it in the comments section of a climate change blog, in response to a denialist. People have the right to form their own opinions, and perhaps they have the right — in their own private worlds — to believe in their own facts (in my fantasies, my height suits my weight a lot better! ), but they do not have the right to confound an issue as already complex and knotty as the climate change emergency by applying their own made-up facts to it. 2. Several years ago, a friend of ours bought a piece of rural-ish land (although zoned residential because people put up houses there) that had been scraped bare of all its topsoil. Literally. The previous owner had scraped off and sold all the topsoil and gravel underneath, so this property was about four feet lower than the neighbouring properties. Over the years, he has built the soil back up by truckloads of grass clippings, leaves and manure from local landscapers and farmers. He has created a wonderful market garden (and indeed started a local farmers market) and now grows all sorts of food on land that was once a moonscape. But our friend has been threatened with legal action because "agriculture" is a use of the property that is against the zoning bylaw. (A neighbour complained about the piles of stuff.) Apparently homeowners in that particular municipality have the right to sell off the life of a property, but not to add life to a property. Gives new meaning to the notion of private property rights, eh? So, are we entitled to grow food — or aren't we? Is food growing a right, or merely a privilege, depending on the whims of your town council? I see food growing as a human right (at least for the last 10,000 years or so), and certainly a growing need as the climate change emergency threatens our food security more and more. Here in Canada, we don't use the term "entitlements" for government payments to citizens. So I'm not talking about that kind of entitlement (and folks, walk a mile in the shoes of those who receive so-called handouts before judging them). What I'm talking about is ... Are we entitled to a safe climate? Are our children entitled to a viable future? Are future generations entitled to economic and legal rights? And are the other species we share the planet with entitled to, well, their share of the planet?